In honor of his global impact and revolutionary vision for the future of Scripps Institution of Oceanography, we seek partners and leadership support to establish and endow the Walter Munk Chair in Ocean Exploration — ensuring the continuation of his legacy of scientific excellence and daring exploration. Over a century of philanthropy at Scripps has allowed us to expand our capabilities in the most innovative ways. 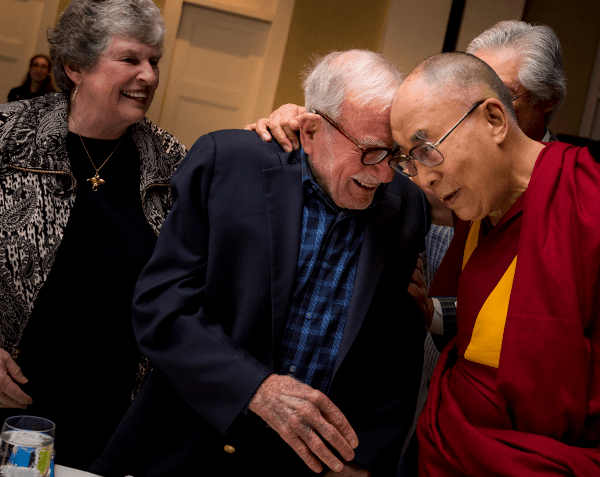 Now, in the midst of the Campaign for UC San Diego and at a time of remarkable potential, this is the perfect opportunity for friends and members of our community to play a meaningful part in celebrating Walter Munk’s 100th birthday and the 78th anniversary of his career as a Scripps scientist, innovator, and mentor. Walter holds the Secretary of the Navy/Chief of Naval Operations Oceanography Chair at Scripps, a singular honor he has held for the past 35 years. Among his many prestigious awards, he has received the National Medal of Science, the Kyoto Prize, and the Crafoord Prize. He is a much-loved and admired icon who has made seminal contributions in a wide range of scientific fields. 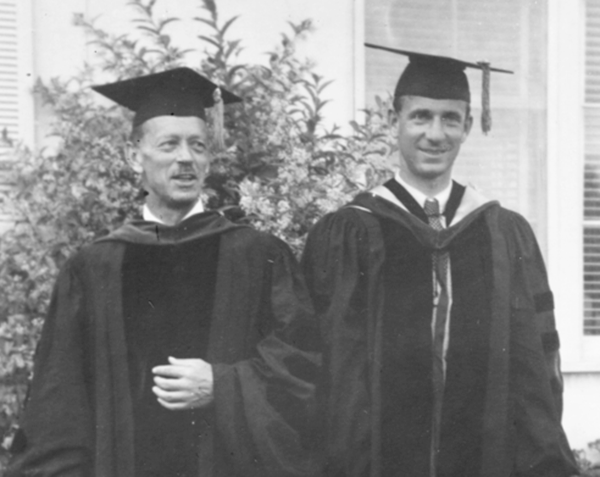 Walter Munk’s pioneering history with Scripps began in 1939 as a summer intern. The following year, after earning a BS in physics at the California Institute of Technology, director and distinguished Norwegian oceanographer Harald Sverdrup accepted him as a doctoral student. From that point on, Walter’s work has defined and expanded the fields of oceanography and geophysics and, in turn, our understanding of the world’s oceans and planetary sciences. 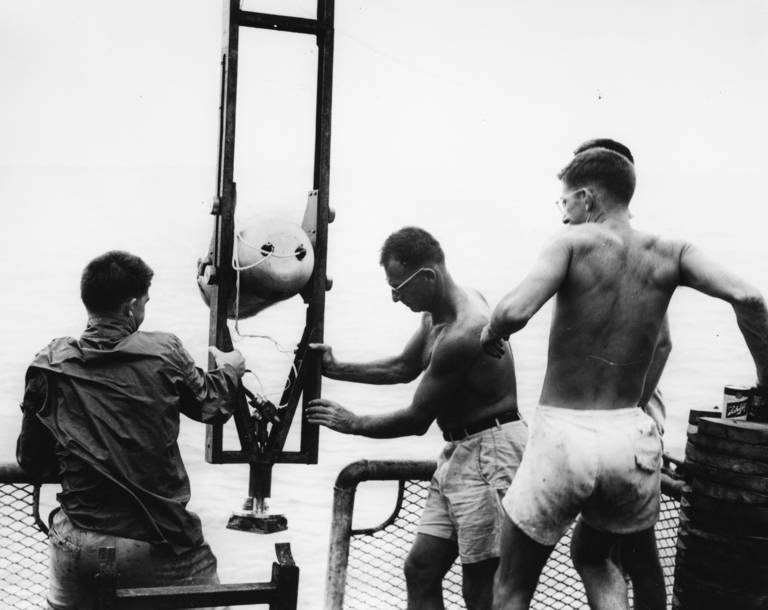 Lowering a deep-sea camera in1952. Together with Harald Sverdrup, Walter developed scientific methods to predict surf activity — methods critical to determining General Eisenhower’s timing of the amphibious Normandy invasion in 1944. After World War II, Walter helped to analyze the currents, diffusion, and water exchanges at Bikini Atoll in the South Pacific, where the United States was testing nuclear weapons. Walter and his colleague, Gordon MacDonald, showed how astronomical measurements of the earth’s wobble and spin can be used to learn about global winds and the distribution of glaciers, air, and water. As a precursor to the successful Deep-Sea Drilling Project, Walter proposed and was a key instigator of the MOHOLE project, whose goal was to drill through the ocean’s crust to collect a sample of the earth’s mantle. Walter, with Frank Snodgrass, pioneered the use of precise measurement of pressure on the seafloor to study ocean swell and tides. In the early 1970s, Walter, together with Chris Garrett, developed a universal description of the ocean internal wave field, which endures to this day. Together with Carl Wunsch, Walter founded the field of “ocean acoustic tomography,” in which underwater sound is used to measure large-scale ocean temperatures and currents. Walter founded the Cecil H. and Ida M. Green Institute of Geophysics and Planetary Physics (IGPP) at Scripps, an “institute within an institute” recognized internationally as an outstanding research and teaching center in geophysics. To sustain a vibrant planet that can feed and fuel its projected nine billion human residents in the 21st century, Scripps scientists are driven by a responsibility and obligation to produce meaningful, actionable results. An endowed chair is one of the most effective tools in enabling them to do so. The Walter Munk Endowed Chair in Ocean Exploration will be established with a leadership gift or gifts, with the principal being invested in perpetuity in a balanced portfolio. The endowment payout provides a continuous reliable source of annual unrestricted support to benefit a distinguished oceanographer for their academic and research efforts. Walter and his wife, community leader Mary Coakley Munk, with His Holiness the 14th Dalai Lama, 2017. Because government and foundation research grants are often bound with restrictions, endowed chair funds are prized for filling funding gaps and/or for seizing opportunities, such as purchasing a vital piece of equipment, covering travel to remote research sites, or presenting at symposia. Moreover, unrestricted endowment funds fuel innovation by allowing a chair holder to pursue speculative basic research, which is rarely supported by government agencies. Finally, chair funds create jobs and opportunities by providing the means to hire graduate students or post docs, who in turn are trained and inspired by their mentors. The Munk Endowed Chair will provide a continuous, reliable source of annual support to a succession of distinguished oceanographers who will use these funds in their academic and research efforts to continue Walter’s legacy at the nation’s leading Earth and environmental research institution. Celebrate Walter’s century of impact on our planet and honor his 78 years at Scripps as a professor, researcher, mentor, and friend with your gift to the Walter Munk Endowed Chair in Ocean Exploration. 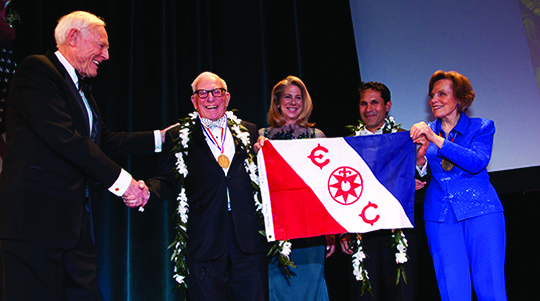 Walter and Scripps researcher Octavio Aburto returned the Explorers Club flag at its annual meeting after traveling to see Walter's namesake devil ray for the first time, 2014.